You cannot just start cooking meals right off the bat, first you must add on the kitchen (see House Extensions). You will be able to use 3 different utensils to cook, this includes the Frying Pan, Pot and Oven. There are many recipes! To begin cooking, stand in front of the utensil you want to use and press the X button. 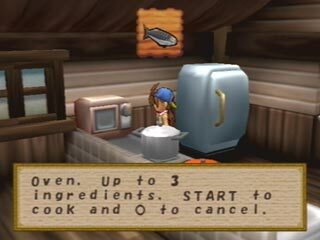 You can then select up to 3 ingredients to use from your Rucksack, and then press the Start button when you're ready to cook. That's all you have to do! If you are rotating through the ingredients and you can't remember the name of something, press the Select button and a description will pop up. The items you have stored in your Freezer are not available for ingredient selection so you'll have to put any of those items in your Rucksack if you want to use them in a recipe.